Here's an easy way to reuse and repurpose a holiday decoration that may not otherwise see the light of day until Christmastime! 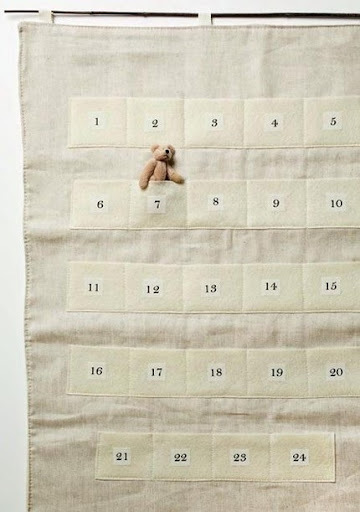 Ohdeedoh reports this savvy tip from Home and Harmony, where one resourceful mom uses an Advent calendar to count down the days to her child's birthday. She uses a tiny teddy bear to move from pouch to pouch, getting closer and closer to the big day! My daughter is literally obsessed with birthdays (anyone's birthday!)... and I think this is an ingenious way to make kids feel even more special and excited about their upcoming celebration. The Advent Calendar shown above is available here.